A suspected tractor thief was arrested after attempting to flee police on the North Freeway. 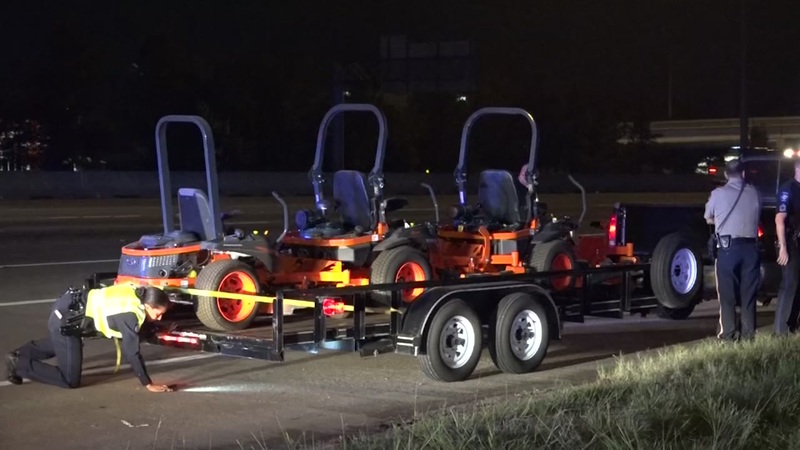 CONROE, TX (KTRK) -- One person has been arrested and a second is on the run after police say they caught them with three stolen tractors in tow. An officer with the Shenandoah Police Department was driving southbound on the North Freeway near FM 1488 when he noticed the gate was open at Lansdowne Moody Tractor Sales in Conroe. Fresh tire tracks were found coming out of the business and that is when the officer alerted Conroe police. A short time later on the North Freeway near Timberlock, another officer saw a black pickup truck pulling a trailer with three new Kabota Zero-Turn lawn tractors on it. When the officer went to stop the vehicle, the driver pulled the truck over before he and his passenger attempted to flee on foot. One man was arrested immediately. The second is still on the loose after running behind the Kirby Steakhouse near Woodlands Parkway. Police say the truck was stolen from a woman on Fuqua near the Gulf Freeway Friday night.